The Commodore looks like a typical Brooklyn dive bar from the outside. And pretty much on the inside, too. But as a native Brooklynite, I can tell you this is the only one with a long list of amazing tiki-inspired cocktails and (what I consider to be) the best fried chicken sandwich in Brooklyn. Be warned: The bar is almost always packed out with locals, especially after 21:00 on Thursday – Saturday nights. Still, if you’re only here for a few days, it’s worth the battle to make it to the crowded bar, order your drink, and scout out a table. It’s hard to get one of the booths, but there’s standing room at high tables near the bar that you can share with the locals and visitors alike who are also there for the cocktails and chicken. Special tip: The kitchen stays open late (until 01:00) on Friday and Saturday. 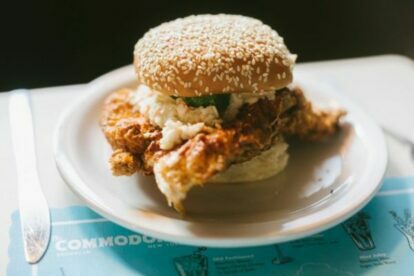 Bar hop around the neighborhood and plan to arrive at The Commodore around midnight for their famous hot or mild fried chicken sandwich. Don’t sleep on the biscuits and butter, or as I like to call them, the best preventative treatment for tomorrow’s hangover.